The CD Evening Bag Recycle with style! Using CDs and some clever design, make a fabulous evening bag that will make a statement! You have several assembly choices that produce VERY different results. From a '20s flapper style bag to a thoroughly modern design statements... it is up to you. Great kit for teens and tweens! Kit contents and details, plus other options. Our fabulous Wired Woman series: 3 "kit groups"
This woman is wired for change! Sporting free-swinging bugle bead bead hair anchored on the glass bead head, arms outstretched to grasp the world, and a skirt reminiscent of Olive Oyl (with bead legs & feet showing), this "wired woman" can be worn as a pin (with provided pin back) or displayed on a desk with pride. 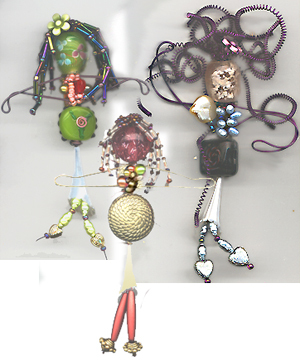 pin back, mixed beads and pearls for chest ruffle Tools and materials you will need for all kitz. 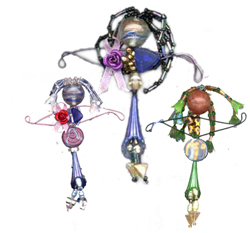 Any of the wired women kitz can be altered by curling the wire in the kit, and the white "skirt bead" can be painted any color with acrylic or nail enamel.